After watching Blues Clues for the umpteenth time today (which is, in my opinion, one of the most annoying shows on the planet), the kids are finally asleep, at least for now, and it is time for mommy to unwind. Unfortunately this mommy has the toothbrush song stuck in her head. I know kids learn better through song, but does every TV show have to have a song about brushing our teeth? And do they all have to be so catchy? 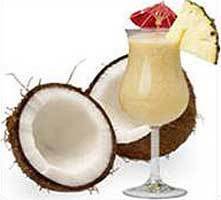 It is about 95 degrees outside, and a cold, smooth pina colada sounds really nice. I wanted to share this amazing, and very easy recipe with you. Maybe after you get your kids to bed, you can try it. Put everything in a blender with 2 cups crushed ice. Blend on high until it looks smooth.